Eden Road is a boutique wine company creating some of the most exciting contemporary wines from the ancient soils of the Australian high country. Their relentless and passionate search for exceptional terroir ensures the creation of unique, authentic wines. Few wine companies as young or as small as Eden Road have won as many prestigious awards. Their dedication to searching for great terroir, coupled with the desire and devotion to unlocking the potential and uniqueness in their wines paved their road to success. 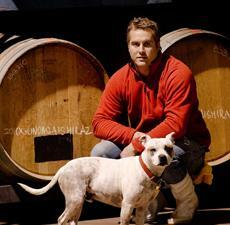 Nick is the Winemaker at Eden Road Wines, heading an experienced wine making and cellar team. He has taken a unique path in discovering his passion for winemaking. Nick’s journey began after an intimate tasting with Jean Charles Boisette at Domaine de La Vougeraie. His experience in the wine industry has included roles at Rosemount, Coldstream Hills and Madew. From there he moved to Bordeaux for four years where he assumed the position of winemaker and consultant for various wineries in Eastern Europe. Nick enjoys leading his team out onto the boundaries of new and old world winemaking practices, always keeping in mind the ultimate enjoyment of the wine drinker.